Vice President Mike Pence skirted around definitively saying that the United States is "morally superior" to Russia when asked Sunday in an interview on CBS's "Face the Nation." Pence said he saw no "moral equivalency" when President Donald Trump defended Russian President Vladimir Putin, saying that America isn't innocent either in an upcoming FOX News interview. "Face the Nation" host John Dickerson brought up that during President Barack Obama's time in office he was often criticized by Republicans for not projecting American exceptionalism, and that perhaps President Trump's statement comparing Russia to America was a more blatant example of anti-American exceptionalism than what Obama was called out for during his time as president. "What you heard there was a determination to attempt to deal with the world as it is," Pence said. "Let's start afresh with Putin, and start afresh with Russia." Dickerson then bluntly asked Pence, "Do you think America is morally superior to Russia?" The vice president dodged the issue, speaking in broad, general terms and not directly addressing the question of American and Russian standing. "What we have in this new president is someone who is willing to engage the world, including Russia, and saying where can we find common interests that will advance the security of the American people, the peace and prosperity of the world, and he is determined to come at that in a new and renewed way." After multiple attempts to get an answer from Pence, the Dickerson again asked, "Shouldn't we be able to just say yes to that question? That America is morally superior to Russia?" Pence again dodged the question, but offered a final response without addressing Russia, "I think it is without question, John, that American ideals are superior to countries all across the world." 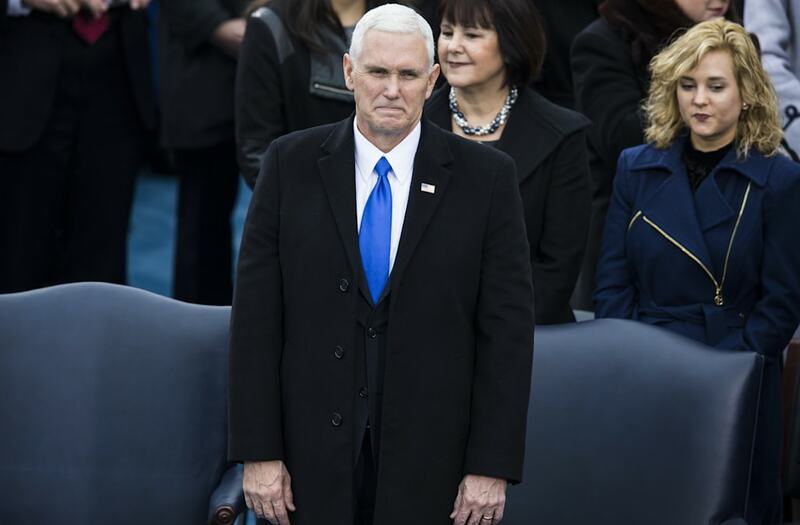 US President-elect Donald J. Trump and US Vice President-elect Mike Pence participate in a wreath laying ceremony at Arlington National Cemetery on January 19, 2017 in Arlington, Virginia. Hundreds of thousands of people are expected to come to the National Mall to witness Trump being sworn in as the 45th president of the United States. US President-elect Donald Trump and Vice President-elect Mike Pence take part in a wreath-laying ceremony at Arlington National Cemetery in Arlington, Virginia on January 19, 2017. U.S. President-elect Donald Trump and Vice President-elect Mike Pence participate in a wreath laying ceremony at the Tomb of the Unknowns in Arlington National Cemetery outside Washington, U.S., January 19, 2017, one day before Trump's inauguration as the nation's 45th president. U.S. President-elect Donald Trump (L) and Vice President-elect Mike Pence (C) participate in a wreath laying ceremony at Arlington National Cemetery outside Washington, U.S., January 19, 2017, one day before Trump's inauguration as the nation's 45th president. U.S. President-elect Donald Trump (L) and Vice President-elect Mike Pence (2nd L) lay a wreath at the Tomb of the Unknowns at Arlington National Cemetery in Arlington, Virginia, U.S. January 19, 2017. U.S. President-elect Donald Trump (C) and Vice President-elect Mike Pence (R) depart after laying a wreath at the Tomb of the Unknowns at Arlington National Cemetery in Arlington, Virginia, U.S. January 19, 2017. Melania Trump walks down the steps during a wreath laying ceremony with US President-elect Donald Trump and Vice President-elect Mike Pence at Arlington National Cemetery in Arlington, Virginia on January 19, 2017. US President-elect Donald Trump(L) and Vice President-elect Mike Pence take part in a wreath-laying ceremony at Arlington National Cemetery in Arlington, Virginia on January 19, 2017. US President-elect Donald Trump and Vice President-elect Mike Pence take part in a wreath-laying ceremony as his family watches at Arlington National Cemetery in Arlington, Virginia on January 19, 2017. The Trump administration has been criticized for its coziness with Putin, and over the weekend further controversy emerged when FOX News released a clip from an upcoming interview where Bill O'Reilly asked Trump about the Russian president being a "killer." When asked if he respected Putin, Trump said, "I do respect him. Well, I respect a lot of people, but that doesn't mean I'll get along with them." O'Reilly pressed Trump that "Putin is a killer." "There are a lot of killers. We have a lot of killers," Trump said. "You think our country is so innocent?"